An emotional appeal has been launched to find the relatives of an RAF airman from Huntingdon who was the sole survivor of a plane crash in World War Two. Researchers in Germany have only just discovered the crash site near Ludwigshafen, just south of Frankfurt. Gunner Harry Barnard, who hailed from Cambridgeshire, was the only crew member who survived when the Stirling bomber came down in early September 1943. It's thought that he managed to trigger his parachute seconds before the plane hit the ground. The other six members on board, three British men and three men from New Zealand, were killed. The plane was part of the 149th Squadron that set off from RAF Lakenheath in Suffolk to bomb the cities of Ludwigshafen and Mannheim. 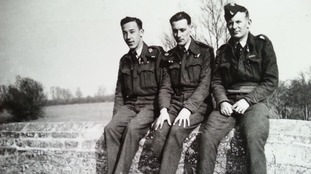 Now, 75 years on, Dutch crash site researcher Erik Wieman is hoping to trace the descendants of the men so that he can invite them to a memorial service that would be held in their honour. Mr Wieman has already made contact with four of the families, but is still trying to track down the other three. According to Mr Wieman, Mr Barnard saw out the rest of the war as a prisoner of war and passed away in the 1970s. If you have any information please email us: anglianews@itv.com or contact us via our Facebook page.